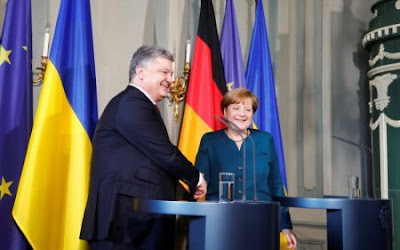 BERLIN, Germany -- German Chancellor Angela Merkel and Ukrainian President Petro Poroshenko agreed on Saturday to try to improve the security situation in eastern Ukraine and return to implementing the Minsk ceasefire deal after an upsurge in violence there. German Chancellor Angela Merkel and Ukrainian President Petro Poroshenko shake hands after adressing the media at the German government guesthouse Meseberg Palace in Meseberg. A ceasefire agreement signed in February 2015 in Minsk that aims to end the conflict between Ukrainian government forces and pro-Russian separatists has failed to end artillery fighting. Each side accuses the other of violating the truce. Before holding two-way talks outside Berlin, Merkel said that after a lull over Easter, an increase in breaches of the ceasefire was "unfortunately" evident. "Today our main theme will be how to improve the security situation. The security situation ... is the main precondition for making further political progress," she said. Poroshenko also expressed support for the process. "We must act decisively to return the Minsk process to a constructive course and we do not see an alternative to the Minsk process," he said. Merkel and former French President Francois Hollande had worked hard to find a political solution to the conflict and were in regular contact with Poroshenko and Russian President Vladimir Putin in a four-way group called the Normandy format. Merkel said that new French President Emmanuel Macron had made clear during talks this week that he was committed to continuing that process. "We will continue with the Minsk process and the Normandy format will exist. We will very quickly look for possibilities for the four presidents, or three presidents and one chancellor, to be in contact with each other," said Merkel. Fighting between pro-Russian rebels and government forces first broke out in April 2014 after a pro-European uprising in Kiev ousted Ukraine's Moscow-backed president. About 10,000 people have been killed in the three-year conflict. The European Union imposed sanctions on Russia after Moscow annexed Crimea from Ukraine in 2014 and then backed separatist rebels in the east.